The U.S. bishops are urging Catholics nationwide to participate in nine days of prayer, penance, and pilgrimage between January 19-27, marking the 40th anniversary of the Roe v. Wade decision. “The bishops recognize that prayer is the foundation of all our efforts on behalf of human life,” said Tom Grenchik, executive director of the USCCB’s Secretariat of Pro-Life Activities. Hundreds of thousands of pro-life activists are expected to gather in Washington D.C. on January 25 for the annual March for Life. Key events during the nine day period will include the National Prayer Vigil for Life, January 24-25, and the Rally and March for Life, January 25. The bishops are also running a youth video contest that is open to middle and high school students. Students are invited to submit a 30-60-second video that should be recorded while participating in activities surrounding the 40th anniversary of Roe v. Wade. Details of the contest are available here. 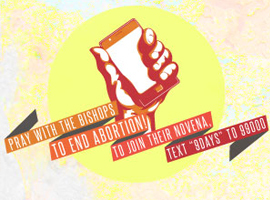 As well, the bishops are encouraging young adults to use their Facebook profile pictures to support the sanctity of life. Details are available here. The USCCB will feature guest bloggers the week of January 22 providing their personal pro-life testimonials. Each day during the nine days the bishops will provide an intercession, brief prayers and a reflection, daily suggestions for concrete acts of prayer, penance and charity, and an abortion-related myth/reality fact. Catholics can sign up to receive the novena daily by e-mail by visiting the website for the event, or by text message by texting “9days” to 99000. The novena will also be posted daily on “People of Life,” the USCCB Pro-Life Secretariat’s Facebook page, and tweeted from “USCCB” on Twitter. Roe v. Wade, the Supreme Court decision that legalized abortion in the U.S., was handed down on January 22, 1973. Prayer resources and program models for these suggested activities are available here. This article is courtesy of LifeSiteNews.com.